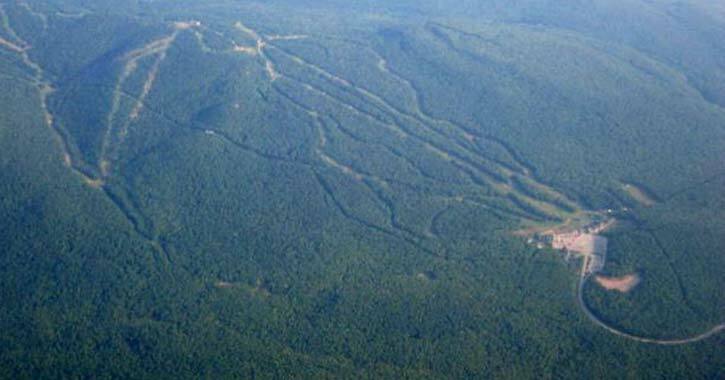 Nicknamed "Little Gore" and "Old Gore," the historic North Creek Ski Bowl in North Creek, NY is a pioneering ski area in the United States. The Ski Bowl property opened in 1934 as a small, downhill skiing site. Since then, not only has the Ski Bowl expanded and become a key part of Gore Mountain, but it has transformed into a true year-round attraction in the Southern Adirondacks. The idea for a winter sports destination in the Southern Adirondacks came from Vincent Schaefer, a meterologist and Schenectady native. 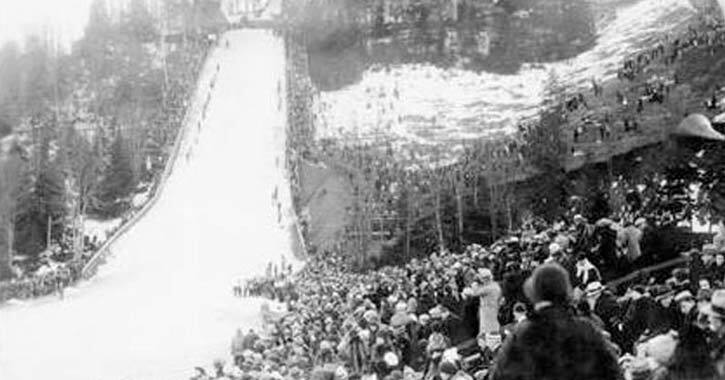 After Schaefer attended the 1932 Winter Olympics in Lake Placid, he was inspired to create a place where he and fellow skiers could go downhill skiing together in the Adirondacks. His friend and pilot Irving Langumuir flew him around the region in search of a destination that offered snowy mountains and rail access. North Creek turned out to be his first choice, while Wilmington was a close second. Schaefer saw the potential of North Creek as a ski destination, and he began to explore interest in a snow train that would bring visitors from the city to the area. 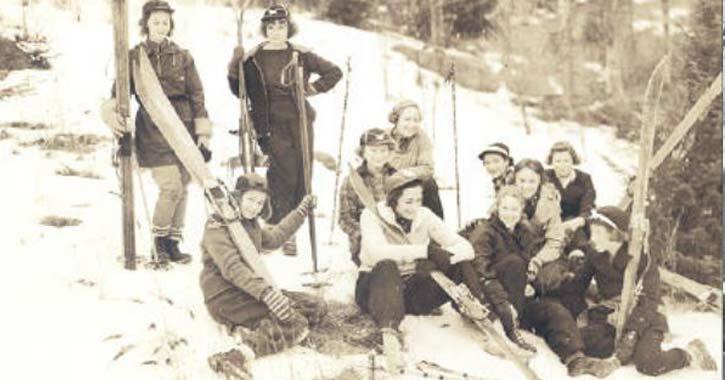 In November 1932, Schaefer founded the Schenectady Wintersports Club and organized ski trail construction in North Creek. 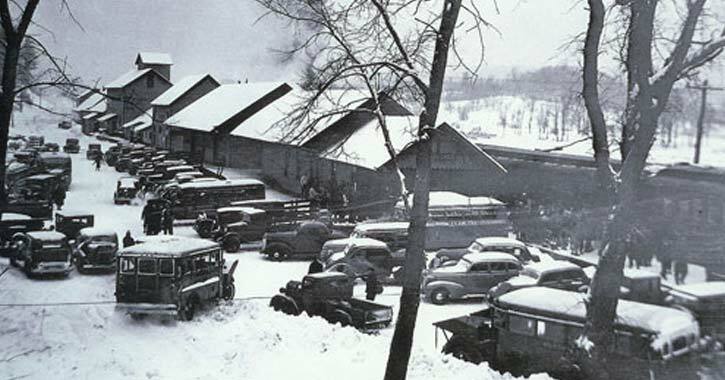 The Snow Trains: "Ride Up, Slide Down"
After much planning and trail work, the first snow train from Schenectady brought 378 skiers to the future location of the North Creek Ski Bowl on March 4, 1934. The round-trip price was just $1.50 per person. The snow train was extremely popular and helped showcase North Creek as a prime ski destination. At the time, skiers got off the train and would ride in the back of a truck to the top of the slopes. This process was best described by Wintersports Club member Bill Gluesing as "Ride Up, Slide Down," which would become a slogan for the region. Around the same time snow trains brought skiers to North Creek, the first rope ski tow was built in Woodstock, VT. Vincent Schaefer's brother, Carl Schaefer, saw an opportunity to construct one of these new lifts in North Creek. Carl Schaefer decided to build his ski tow at a different part of the North Creek Ski Bowl, one owned by the Town of Johnsburg for ski development. After receiving permission from the town, in the winter of 1935, Carl Schaefer built NY State's first ski tow at the Ski Bowl. When the snow trains arrived that winter, the popularity of the area as a ski destination soared. Although Schaefer moved his ski tow to a new property the following winter, in its place, the newly-formed Gore Mountain Ski Club sponsored Burt Burns and Emmett Higgins to build the Ski Bowl's new lift. From the 1940s-1960s, the North Creek Ski Bowl continued to grow in popularity. In 1946, the Gore Mountain Ski Corporation, a partnership between the Gore Mountain Ski Club and investors, purchased the Ski Bowl's assets. Their goal was to improve ski lift service in the area, starting with a 3,000-foot electric t-bar lift. The lift allowed for the creation of new trails and slopes, greatly expanding the Ski Bowl and making it a huge winter attraction in North Creek and the Gore Mountain Region. However, in the early 1960s, competition arose with the opening of the adjacent Gore Mountain ski area. As visitors skied at Gore Mountain, the Ski Bowl faced new difficulties keeping up. Although they were able to advertise and highlight the shorter waiting lines and uncrowded trails, Gore Mountain was quickly becoming the area’s premier ski site. Ownership of the Ski Bowl changed hands over the next few years, and attempts to transform it into a true four-season resort failed. This was the start of a tough period for the Ski Bowl as the main t-bar lift was left to decay and the base lodge burned down. It would be many years before the Ski Bowl would become a major ski site once more. In the early 21st century, the North Creek Ski Bowl’s future was uncertain. 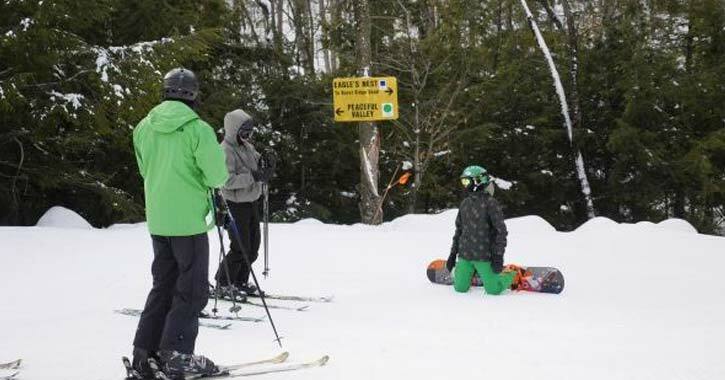 The Olympic Regional Development Authority (ORDA) was in charge of the development of Gore Mountain, and while visitors flocked to that ski resort, skiing had effectively ended at the North Creek Ski Bowl. Instead, the Ski Bowl operated as a local recreational park for the Town of Johnsburg. Featuring baseball fields, tennis courts, a beach, a public pavilion for festivals, events, and more, visitors could enjoy a variety of warm weather outdoor activities. Despite the lack of skiing, the site was still seen as a prime location for other developments, particularly by Gore Mountain itself. Gore partnered with the Town of Johnsburg in 2003 and opened a snow tubing park at the Ski Bowl near the site of the first ski tow. Two years later, plans for Ski Bowl Village, a ski-in/ski-out site were announced, and public skiing was brought back to the Ski Bowl. From 2007-2011, a terrain park was created, a new Hudson Chair ski lift connected Gore to the Ski Bowl, and skiers were once again attracted to the site. Thanks to the new partnership between Gore Mountain and the Town of Johnsburg, the North Creek Ski Bowl is now part of Gore's popular nordic skiing area. Today, the North Creek Ski Bowl is recognized as a four-season recreation hotspot and community complex in the Adirondack Park. ORDA manages the Ski Bowl in winter as part of Gore Mountain's seasonal recreational activities. Visitors can enjoy alpine skiing and snowboarding, freestyle fun, cross-country skiing and snowshoeing, and more at this hub. Not only that, but the site features snowmaking and lights, so you can experience twilight skiing/riding if you'd prefer. Over the years, ORDA has worked hard to make the Ski Bowl accessible by connecting it to Gore, and now visitors can travel between them via a combination of lifts and trails. Use of the site's facilities is included with Gore's day tickets and season passes. During the warmer months, the Town of Johnsburg takes over management of the community complex. The site's facilities have seen improvements and upgrades over the years, and some of its newer offerings include hiking and mountain biking trails and Johnsburg's Youth Program. In November 2017, ORDA came to an agreement with the Town of Johnsburg to allow Gore to develop summer attractions/activities on part of the land. When paired with Gore Mountain's gondola skyrides, outdoor Adventure Village, mini golf course, and other seasonal activities and events, you can't deny that both ski sites have helped turn North Creek into a year-round Adirondack vacation destination. Davis, Jeremy K. Lost Ski Areas of the Southern Adirondacks. Charleston, SC: History, 2012. E-Book.